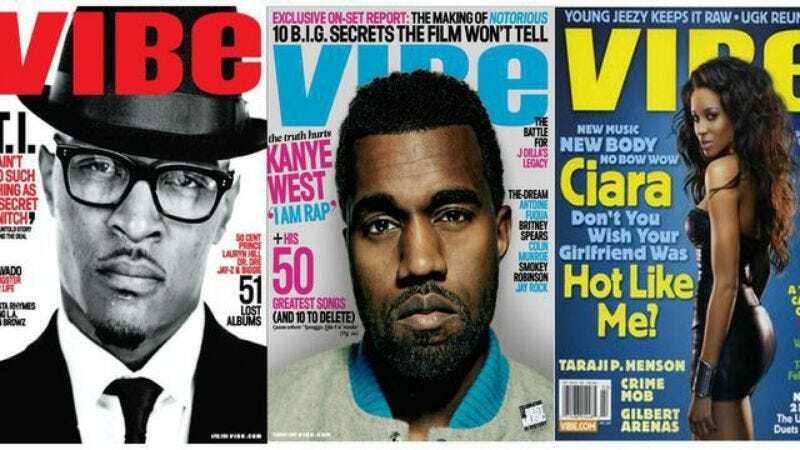 Presumably due to the same unforeseeable collapse of print media that forced The Onion to go all-digital, SpinMedia has announced that it’s shutting down the print version of hip-hop magazine Vibe. This comes from Capital (via The Wrap), which says SpinMedia—which bought the magazine in April of 2013—also let go of at least 19 of Vibe’s employees, including editor-in-chief Craig Marks. If this all sounds a bit familiar, it’s because we reported on SpinMedia making Vibe all-digital last year. That move didn’t take, though, and the new owners decided to switch Vibe over to a quarterly publication model instead. But this time it’s really happening for real, and Stephen Blackwell, Spin Media’s CEO, isn’t even pretending that it’s not all about getting Internet hits. “If we had a photo editor position that wasn’t necessarily affecting our growth, and we were obviously paying for that position to be there,” he said. “Can we use that money a little bit better?” In other words, the layoffs are all about getting rid of people with jobs that aren’t directly related to promoting the website. Until some new medium is invented that makes the Internet obsolete—we assume it will be some kind of brain implant—all of Vibe’s future content can now be found at its website.